"I was born in a family of strong artistic atmosphere. Under the influence of the environment, I have grown great interests in art and music since very young; I am particularly indulged in painting. In 1918, I was admitted to Taiwan Governor-General's National Language School (namely the former Provincial Taipei Normal College today) during Japanese Ruling Period and started accessing formal art education. I then become more fascinated by painting and was inspired to devote my career in painting. I planned to go to the Tokyo Arts School (namely the former Tokyo University of the Arts today) in Japan for advanced study after graduating from the National Normal University. Unfortunately my father disagreed and I could not go to Japan. Against my will, I returned home to teach after graduating from the National Normal University in 1922 and got married under the command of my father in the following year. My father’s intention was to reckon my hope to study in Japan. However as time passed by, my passion for pursuit of arts did not diminish but motivated me to look forward to this inspiration of realizing my dreams. During my spare time, I focused on the study of arts and painting even more and retuned to my school during summer vacation, participating in the “Summer Art Seminar” formed by Mr. Ishikawa Kin’ichiro. My works painted during the spare time from work have been selected into the first and second Taiwan Exhibition in a row. My family no longer insisted me in developing in politics after understanding my talents and inspiration. My father passed away in 1924 after the following few years, my efforts received the confidence from my older brothers and others. Finally my dreams were realized in 1928 and I went to Japan at the age of 27, in order to advance more in arts. Upon initial arrival to Tokyo, I worked day and night to strengthen my skills in sketches. After four months and in March of the following year, I was fortunate to pass the admission examination of Tokyo Arts School and I majored in western painting department. With the encouragement of my older brother, I was able to committee in painting without any concerns or holding back. Unfortunately good times never last forever and my older brother died of illness when I was about to finish the first semester of my second year. The burden of the family suddenly fell on my and I had no choice but took a semester off to stay in Taiwan temporarily. 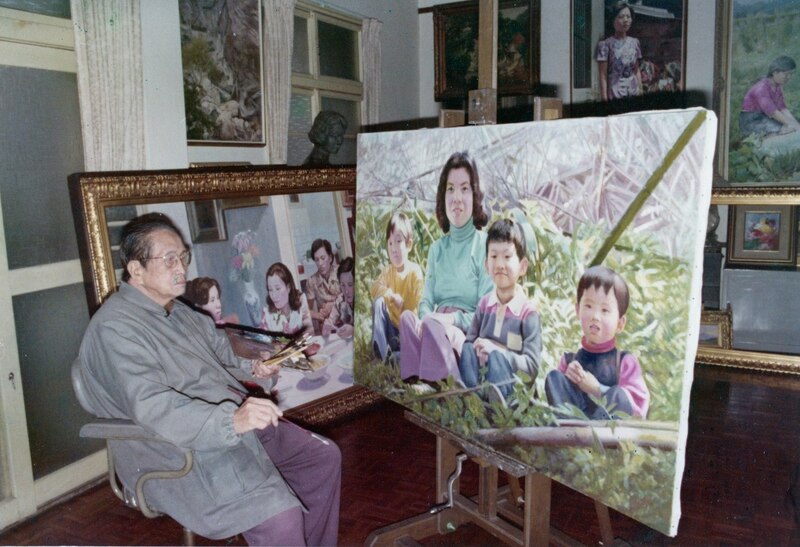 When my older brother passed away, my family suffered a major blow so my mother and relatives all convinced me to give up learning painting in Japan but accept the local offer for public service. Finally impelled by ideas, I have been able to implement my initial intent and after taking care of the family affairs, I was determined to pack up and went to Japan, in order to continue my unfinished academic work. Perhaps due to my nature, in spite of the prevalence of fauvism and other painting trends sweeping Japanese painting industry and causing great impact during my study in Japan, I have never changed my ideas but insisted in my confidence and perseverance. I was determined to recognize my favorite realistic creation style. In the 50s, when the domestic abstract painting trend emerged with extraordinary excitement, many artists went along with the trend. However none of these could shatter my credo and I still strode forward in this straight and in-depth path to realism, neglecting any criticism, appraises and judgment from the external environment. I spent my childhood living in the plain rural area and so I have developed a profound and incomparable relation with my hometown. After I grew up and involved in politics for many years, I was able to experience the traditional living culture through a completely different perspective. Particularly the hosting of reconstruction for Sanxia Qingshui Zushi Temple over the last 30 some years, I have developed further profound understanding of the civil arts in Taiwan, thereby generating a subtle and profound relation with everything in the peripheral environment. The village people are content with life, mild and plain; whose diligent nature leaves people with very friendly image. They have been pushing me to paint and exhibit everything I love on the canvas. One can also say that their honest and passionate life enrich the content of my painting while my painting objectives and ideas are aimed to paint the topics which I love and motivates me, which naturally forms the direction and style of my exceptional creation. Perhaps due to the influence of my older brother who expected me to develop in politics before he passed away, I have also been participating in local self-governance, art movement and art education with enthusiasm in spite the painting has been the career of my life. I have done my best efforts in spite of the many difficulties and troubles. I can now face the spirit of my deceased older brother without any regret and shame. There is no boundary or art but there is limit to my life. When I look back, I have been pursuing and exploring over the last 60 years but still have not reached the state of truth, benevolence and beauty. 저는 예술적 분위기가 풍부한 가정환경에서 자랐으며, 유년시절부터 미술이나 음악에 관심이 많았습니다. 특히 그림그리기에 심취했습니다. 1918년 일제시대 대만총동부국어학교(현재 타이베이교육대학교)에 합격하여 정식으로 미술교육을 받게 됩니다. 이후 회화에 더욱 매료되어 화가가 되기로 결심하게 됩니다. 졸업후 일본도쿄미술학교[東京美術學校](현재 일본국립도쿄예술대학의 전신) 유학계획을 하게 됩니다. 그러나 아버님의 반대로 뜻을 이루지못하였고, 1922년 교육대학을 졸업후 고향으로 돌아와 아버님의 뜻에 따라 결혼하게됩니다. 아버님은 제가 일본유학의 뜻을 접기를 바라셨습니다. 그러나 세월이 지나도 저의 예술에 대한 열정은 더욱더 강렬해졌고, 빨리 그 이상이 실현되기를 바랬습니다. 이로 인해 일을 마친후 화법연구에 전념하게 되었고, 여름방학을 이용해 모교로 돌아가 키니치로 이시카와(石川欽一郎)선생님이 만든 여름방학미술워크샵[暑期美術講習會] 에 참가합니다. 일하는 틈틈히 그려왔던 작품들은 제 1회,제2회 대만미술전람회(臺灣美術展覽會)에서 입선하게 되고, 가족들도 결국 저의 재능과 포부를 이해하고, 더이상 정치가가 되어야 한다고 바라지않았습니다. 1924년 아버님이 돌아가신후 수년이 지나서 ,저희 노력의 성과는 형님의 신념을 얻어냈으며, 예술에 대한 큰 뜻을 펼쳐보고 싶은 포부를 갖고 1928년 27세에 일본유학의 소원을 이루게 됩니다. 도쿄에 도착한 초기에는 낮과밤을 가리지않고 소묘연습에 매진했으며, 4개월후 이듬해 3월에 도쿄미술학교[東京美術學校] 서양학과에 합격하게 됩니다. 형님의 적극적인 응원으로 아무런 걱정없이 그림그리는일에 열중 할 수 있었습니다. 예기치 않게 2학년1학기가 끝난후 ,형님이 병으로 세상을 떠나게 됩니다. 가족에 대한 무거운 책임으로 한학기를 휴학하고 대만에 머물렸습니다. 형님의 죽음은 가족에서 큰 충격을 주었고, 어머님과 친한 친구들이 저에게 일본유학을 그만두고 ,고향으로 돌아와 공직을 맡기를 바랬습니다. 그러나 저의 이상을 실현하고자 가족을 설득하고 ,일본으로 돌아가 학업을 지속하게됩니다. 어쩌면 본능이였는지 일본에서 공부하는 동안 야수파의 사조가 일본화단계에 유행하고 충격을 가져왔지만 ,저의 이상은 동요되지않고, 일관된 자신감과 애착을 가지고, 제가 좋아하는 사실주의 창작스타일이였습니다. 1950년대 대만에서 추상주의 화풍이 급속도로 확산 유행하였지만, 저의 신념은 흔들리지 않았으며, 외부에서 지속된 비평과 비판을 무시하고 계속해서 저는 사실주의를 추구하였습니다. 유년시절 내내 순박한 시골에서 생활을 했기 때문에 고향에 대한 각별한 애정을 갖고 있습니다. 성인이 되어서 수 년간의 정치활동으로 터득한 다양한 시선으로 전통생활문화를 바라보게 되었습니다. 특히 30여년동안 제가 주도하였던 싼샤주스절(三峽祖師廟)재건사업은 보다 심도 있게 대만 민간 예술을 이해하게 되었습니다. 이로 인하여 모든 주변환경의 모든 것에 깊은 애정이 생겼습니다. 마을 사람들은 자신들의 운명 한계를 이해하고 받아들였으며, 그 한계 내에서 힘차고 즐겁게 살고, 마음이 따뜻하고 순박하며, 부지런하고 검소한 천성을 가지고 있으며, 타인에게 매우 친절한 인상은 저로 하여금 끈임없이 붓을 들게하였고, 모든 일들을 진심 어린 사랑을 갖고 화폭에 담아 내었습니다. 그들의 성실하고 열정적인 삶은 제 그림의 내면을 풍부하게 했다고 말할수 있습니다. 이 또한 제가 그림을 그리는 목표이자 이상입니다. 제가 감동받았던 일들을 소재로 삼아 그림으로 그려냈으며 ,자연스럽게 저의 독특한 창작방향이자 화풍이 되었습니다. 아마도 형님 살아생전에 제가 정치 방면으로 능력을 발휘했으면 좋겠다는 계속된 바램의 영향을 받아서 인지, 비록 그림 그리는 일이 평생직업이였지만, 지방 자치, 미술 운동, 미술 교육 등의 일에도 열정적으로 참여하였습니다. 저 개인의 고난과고통도 많았지만 , 최선을 다하였고, 하늘에 계신 형님의 영혼이 부끄럽지 않는 삶을 살았습니다. 예술은 끝이없고, 우리 일생은 끝이있습니다. 되돌아 보면, 60년동안 추구하였던 진선미(真善美)는 아직 그의 경지에 도달하지 않았습니다.